I used to think a single brush -- or fine, a couple of brushes -- would be enough do an eye job. An eye makeup job, that is. It still holds true, and indeed, in some instances, a brush or two may be all you need to create a basic eye makeup look. But that was before I became initiated, and before I had crossed over from the dark side. Now I am a big brush person, and now I know that two seemingly similar-looking brush may actually work very differently and may or may not satisfactorily accomplish the task you had hoped it would do. Poorly blended eyeshadows and racoon eyes, anyone? Let's start with the shader brushes as in the proper order of a properly madeup peepers, they do come first. Eight letters: MUST HAVE. I'm not kidding, ladies! 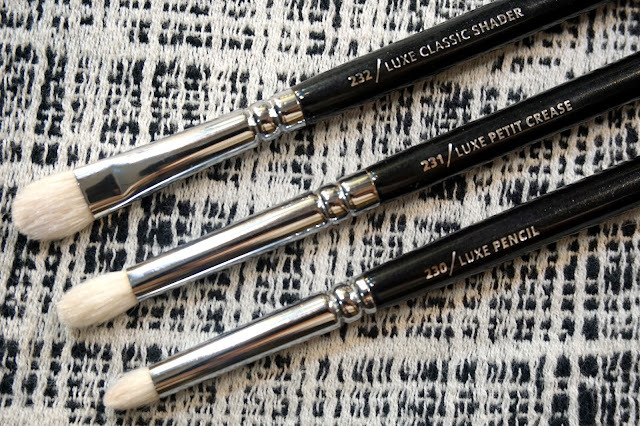 A good, classic shader brush is one of the very first steps when venturing into eyeshadow world. You just have to have a good one. And this is THAT brush! 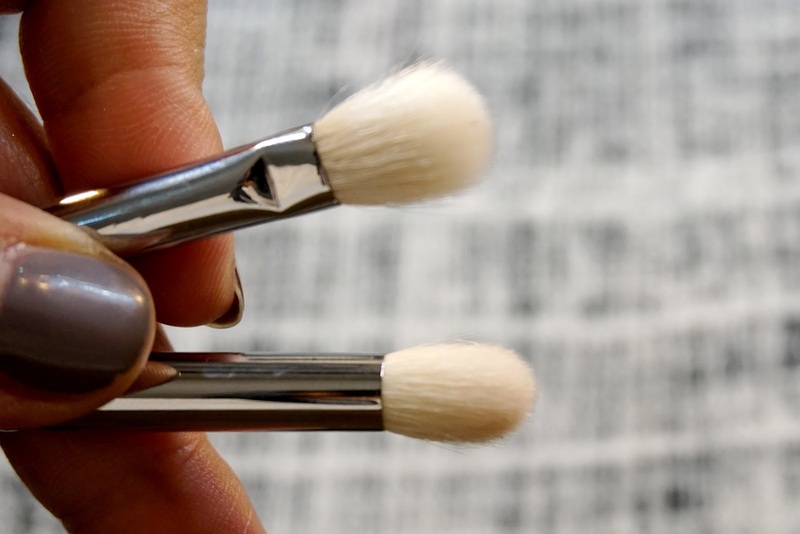 It's a no-fuss brush yet it works like a pro, so I reckon beginners and pro MUAs alike would probably enjoy using this shader brush. It is flat, paddle-shaped, the bristles are kind of compact, and unbelievably soft. It picks just the right amount of pigment and applies very evenly. It's neither too big nor too small; a few pats is all you need to cover the eyelids. It works just as decent in the smokey eye department as well. If I can only have just a single shader brush (ouch, what a painful thought), I would definitely pick this. These two look similar; but 227 is a blending brush. The bristles of this brush are short, compact, tapered. 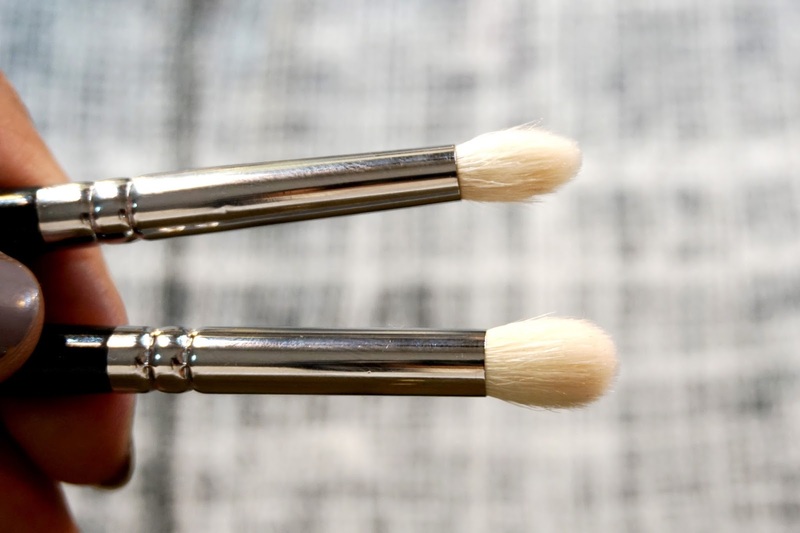 Perfect for putting on contour shade, for defining the crease or the outer V. This gives me a lot of room for control, which is very important, as this brush always deals with the darkest eyeshadow color. If you are upping your eyeshadow game and moving on to more detailed and complicated eyeworks, you definitely need a pencil brush such as this. Good thing I am allowed to have as many shader brushes as I can; I need a crease brush (and at least a dozen others more) after all. This is my powerhouse brush for creasework. It applies crease color evenly, even doing some bit of blending job while at it. Bristles are soft as usual, and all in all, a very reliable brush. My 231 is the petite version; I remember this came along as a freebie when I ordered a few other Zoeva brushes. The only difference between this and the full-sized version is the length of the handle. This is a bit shorter, but very much full-sized when it comes to the bristles and their efficiency. How generous, right? 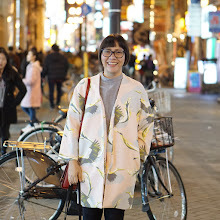 I really would have bought this anyway, but thank you Zoeva! Yes, you need a blending brush, unless you want to end up looking like a racoon or something who plastered on an entire pan of eyeshadow on her eyelids. Blend, blend, blend! A very important step, really. I read a lot that this is perfect for hooded eyes; rumor has it that it can magically create the illusion of a crease where there is none. My eyes are anything but hooded, so I cannot vouch for that. 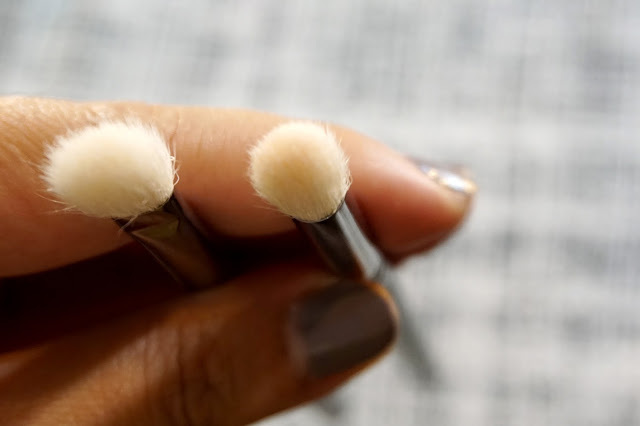 It's a light, soft, fluffy (non-dense) blending brush. To be honest, I have yet to maximize this brush since I do prefer denser blending brushes. For now, I use it to lighly swish and blend my highlight color. Now, this is the part I get very, very excited to be talking about blending jobs and blending brushes. This is one of my most recently acquired brushes, mainly because this has been out of stock for the longest time. 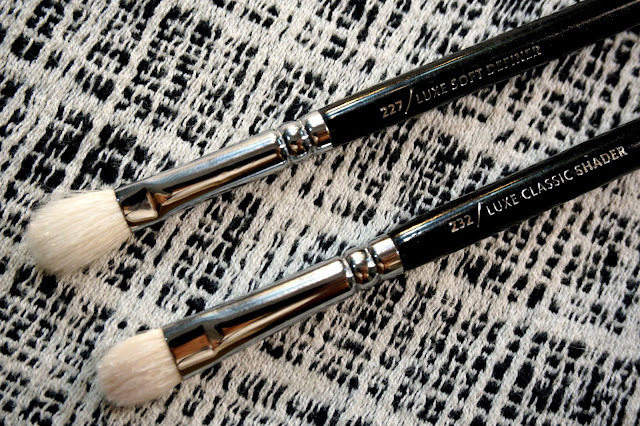 And understandably so -- this is probably the best blending brush among all its Zoeva sisters! 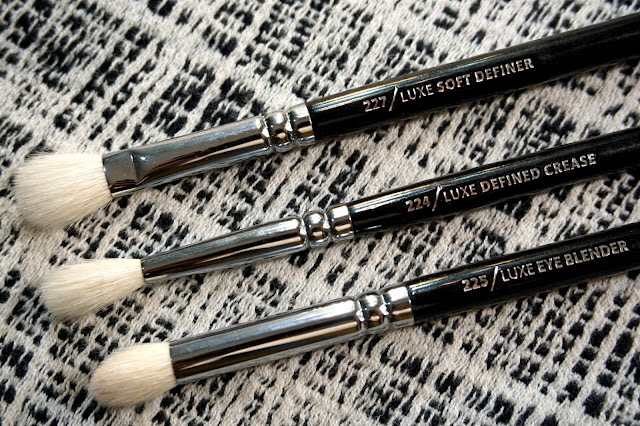 This is dome-shaped, very similar to the luxe crease brush except it's fluffier and denser. It's density and texture are just perfect for blending, especially the crease. And that's very important, since I'm also referring to blending the base + the crease and the highlight + the crease to achieve a clean, well-blended look. It makes the blending job a lot easier and faster. Plus, it's unbelievably soft and it makes blending a dream! This one is definitely a must-have. The 231 luxe crease (above) and 225 luxe eye blender (below) look similar, don't they? This brush is flat at the bottom, with a wider-than-base dome-shaped edge. It looks more like the bigger, fluffier sister of the classic shader. Except that this is no shader brush, but a blending brush rather. 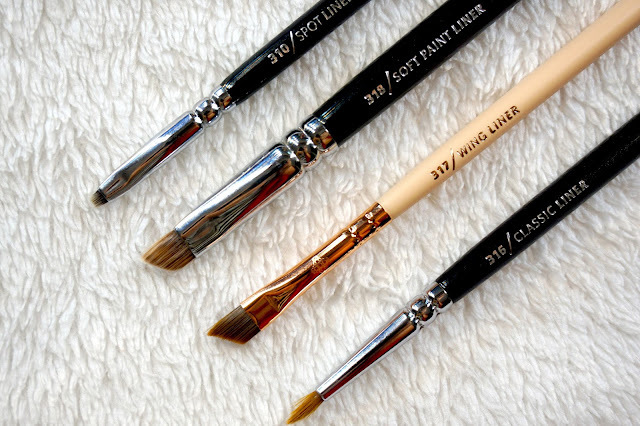 This brush blurs out harsh lines and polishes the overall eye makeup. This used to be my lone blending superstar; it used to be way up there, shining alone. And then the 225 eye blender brush came along -- the two shared that spot, and soon enough, the latter outshone the 227 from then on. That is NOT to say that this brush is not good, though. It's a pretty efficient brush, and pitted against other 'superstar' blending brushes, I would say this has a good fighting chance. Above: 227 luxe soft definer and below: 225 luxe eye blender. A closer look. Luxe soft definer is a lot more fluffy and diffused. I use this in tandem with the 225 eye blender, either before or after the "power blending" part done by 225 for an extra polished look. I also use it mainly for lightly applying AND blending my highlight shadow. You see, it has it's own niche and eliminating it from my daily brush set is out of the picture. And of course, you can't just apply and blend eyeshadows and step out, ready to greet the day. You definitely need eyebrow and eyeliner brushes to complete your eye makeup, girl. 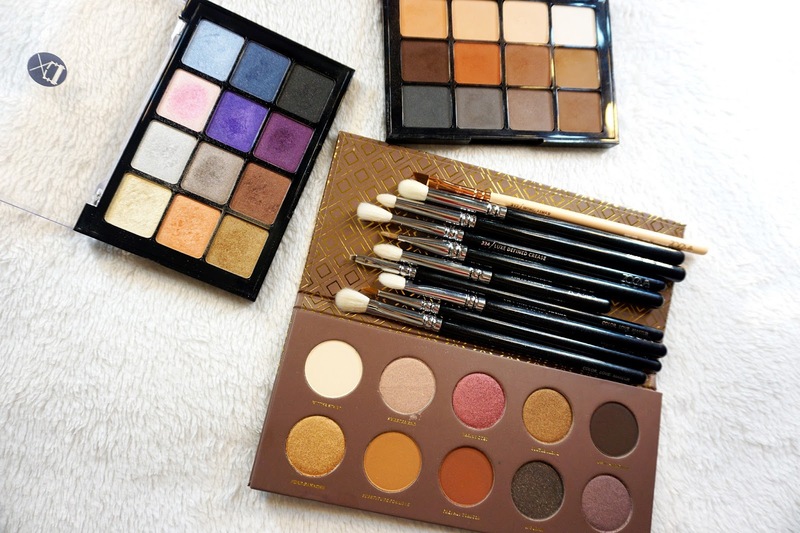 The eyebrow and eyeliner brushes. This is the tiniest brush I have ever seen! 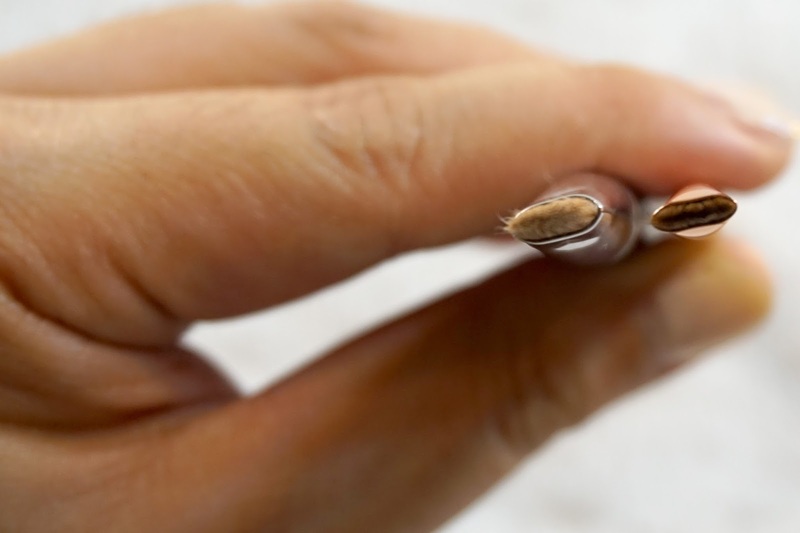 The tip of this brush is flat as your cup of coffee, unbelievably small and short, and very stiff. It creates ultra precise lines, and is perfect for tightlining and working with gel eyeliners. It works just as fine with powder products - for lining your lashline with, or for doing elaborate eye work. I can imagine it doing great in outlining a winged or flicked liner, too. But it does take some getting used to, especially if you have not trudged down the 'tiniest and stiffest brush' alley yet. I prefer my eyeliner just a little bit thicker, so I usually favor other brushes for that purpose. Ahh, when they say classic, Zoeva really means classic. And I love them all the more for that! This brush has long, thin, and fine pointed bristles. Works very well with gel eyeliners and glides on very smoothly. I do wish it were just a little bit more stiff to lessen the blending and flipping while applying some gel liner. This is the newest addition to my Zoeva brushes, and I gotta say -- where have you been all my eyeshadow-obssessing days?! Yes, I use this mainly to apply brow gel, and it does a really suave job. 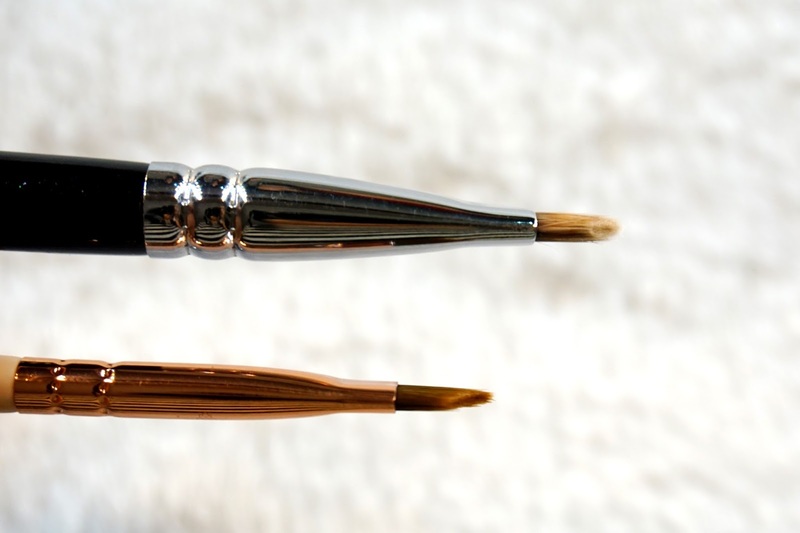 This brush is small, very thin, with a steep angle, and just exactly how I prefer my eyeshadow brushes. I can easily shape my brows using this. 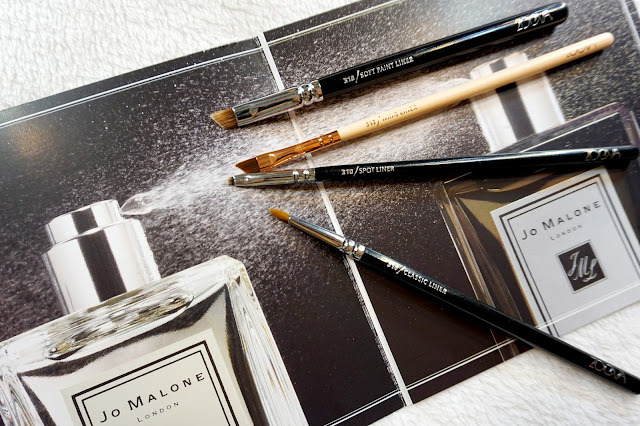 Create HD brows, or come up with subtle brows, this brush could very well do either. But do take note, that this is mainly an eyeliner brush, and more specifically designed for creating that feline flick. I have used this for that purpose, as well. It glides on smoothly, creates a clean line, and is very competent in the cateye department. Big, big thumbs up for this brush! Zoeva describes this as angled multi-purpose brush -- suited for both eyeliner and eyebrow, and can be used with gel, liquid, and even powder products. This is a little bit bigger and noticeably thicker than the 317. Left: 318 soft paint liner vs. right: 317 winged liner. This too has some good reviews online, but I prefer the 317 wing liner as its thickness and size make for an ultra precise and easily controllable application. However, I can imagine this as a better brush for powder products as it is a lot softer compared with the stiff 317. Above is softer and thicker; below is thinner and stiffer. Really great review, I've been looking for some advice on the various Zoeva brushes as I want to add a few extra to my line up. Thanks heaps.